The United States Mint is a unit of the Department of Treasury responsible for producing coinage for the United States to conduct its trade and commerce, as well as controlling the movement of bullion. It does not produce paper money; that responsibility belongs to the Bureau of Engraving and Printing. The Mint was created in Philadelphia in 1792, and soon joined by other centers, whose coins were identified by their own mint marks. There are currently four active coin-producing mints: Philadelphia, Denver, San Francisco, and West Point. The Mint was created by Congress with the Coinage Act of 1792, and originally placed within the Department of State. Per the terms of the Coinage Act, the first Mint building was in Philadelphia, the then capital of the United States; it was the first building of the Republic raised under the Constitution. Today, the Mint's headquarters (a non-coin-producing facility) are in Washington D.C.. It operates mint facilities in Philadelphia, Denver, San Francisco, and West Point, New York and a bullion depository at Fort Knox, Kentucky. Official Mints (Branches) were once also located in Carson City, Nevada; Charlotte, North Carolina; Dahlonega, Georgia; New Orleans, Louisiana; and even in Manila, in the Philippines. The first Director of the United States Mint was renowned scientist David Rittenhouse from 1792 to 1795. The position was held most recently by Edmund C. Moy until his resignation effective January 9, 2011. The position was left vacant until April 2018, until the position was filled by David J. Ryder. Henry Voigt was the first Superintendent and Chief Coiner, and is credited with some of the first U.S. coin designs. Another important position at the Mint is that of Chief Engraver, which has been held by such men as Frank Gasparro, William Barber, Charles E. Barber, James B. Longacre, and Christian Gobrecht. 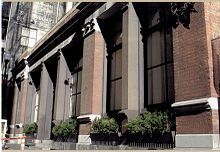 The Mint has operated several branch facilities throughout the United States since the Philadelphia Mint opened in 1792, in a building known as "Ye Olde Mint". With the opening of branch mints came the need for mint marks, an identifying feature on the coin to show its facility of origin. The first of these branch mints were the Charlotte, North Carolina (1838–1861), Dahlonega, Georgia (1838–1861), and New Orleans, Louisiana (1838–1909) branches. Both the Charlotte (C mint mark) and Dahlonega (D mint mark) Mints were opened to facilitate the conversion of local gold deposits into coinage, and minted only gold coins. The Civil War closed both these facilities permanently. The New Orleans Mint (O mint mark) closed at the beginning of the Civil War (1861) and did not re-open until the end of Reconstruction in 1879. During its two stints as a minting facility, it produced both gold and silver coinage in eleven different denominations, though only ten denominations were ever minted there at one time (in 1851 silver three-cent pieces, half dimes, dimes, quarters, half dollars, and gold dollars, Quarter Eagles, half eagles, eagles, and double eagles). A new branch facility was opened in Carson City, Nevada, in 1870; it operated until 1893, with a three-year hiatus from 1886 to 1888. Like the Charlotte and Dahlonega branches, the Carson City Mint (CC mint mark) was opened to take advantage of local precious metal deposits, in this case, a large vein of silver. Though gold coins were also produced there, no base metal coins were. In 1911 the Mint had a female acting director, Margaret Kelly, at that point the highest paid woman on the government's payroll. She stated that women were paid equally within the bureau. A branch of the U.S. mint (Manila Mint) was established in 1920 in Manila in the Philippines, which was then a U.S. territory. To date, the Manila Mint is the only U.S. mint established outside the continental U.S. and was responsible for producing coins (one, five, ten, twenty and fifty centavo denominations). This branch was in production from 1920 to 1922, and then again from 1925 through 1941. Coins struck by this mint bear either the M mintmark (for Manila) or none at all, similar to the Philadelphia mint at the time. A branch mint in The Dalles, Oregon, was commissioned in 1864. Construction was halted in 1870, and the facility never produced any coins, although the building still stands. There are four active coin-producing mints: Philadelphia, Denver, San Francisco, and West Point. The Mint's largest facility is the Philadelphia Mint. 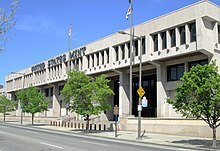 The current facility, which opened in 1969, is the fourth Philadelphia Mint. The first was built in 1792, when Philadelphia was still the U.S. capital, and began operation in 1793. Until 1980, coins minted at Philadelphia bore no mint mark, with the exceptions of the Susan B. Anthony dollar and the wartime Jefferson nickel. In 1980, the P mint mark was added to all U.S. coinage except the cent. Until 1968, the Philadelphia Mint was responsible for nearly all official proof coinage. Philadelphia is also the site of master die production for U.S. coinage, and the engraving and design departments of the Mint are also located there. The Denver branch began life in 1863 as the local assay office, just five years after gold was discovered in the area. By the turn of the century, the office was bringing in over $5 million in annual gold and silver deposits, and in 1906, the Mint opened its new Denver branch. Denver uses a D mint mark and strikes coinage only for circulation, although it did strike, along with three other mints, the $10 gold 1984 Los Angeles Olympic Commemorative. It also produces its own working dies, as well as working dies for the other mints. Although the Denver and Dahlonega mints used the same mint mark D, they were never in operation at the same time, so this is not a source of ambiguity. A coin press built for the San Francisco Mint by Morgan & Orr in 1873. It is currently located at the ANA Money Museum in Colorado Springs. The West Point branch is the newest mint facility, gaining official status as a branch mint in 1988. Its predecessor, the West Point Bullion Depository, was opened in 1937, and cents were produced there from 1973 to 1986. Along with these, which were identical to those produced at Philadelphia, West Point has struck a great deal of commemorative and proof coinage bearing the W mint mark. In 1996, West Point produced clad dimes, but for collectors, not for circulation. The West Point facility is still used for storage of part of the United States' gold bullion reserves, and West Point is now the United States' production facility for gold, silver, platinum, and palladium American Eagle coins. While not a coin production facility, the U.S. Bullion Depository at Fort Knox, Kentucky, is another facility of the Mint. Its primary purpose is for storage of the United States and other countries' gold and silver bullion reserves. Note that the Mint is not responsible for the production of American paper money; that is the responsibility of the Bureau of Engraving and Printing. In 2000, the Mint was responsible for the production of 28 billion coins. See United States Mint coin production for annual production values of each coin. The United States Mint Police, a federal law enforcement agency, is responsible for the protection of Mint facilities, employees and reserves. The production and sale of circulating coinage and the other functions of the Mint are funded through the United States Mint Public Enterprise Fund, established in 1995. Any profits made by the Fund in excess of operating requirements are returned to the Treasury. Government procurement regulations do not apply to the Mint's procurement and contracting activity. Lincoln memorial cent, with the S mintmark of the San Francisco mint. With the exception of a brief period in 1838 and 1839, all coins minted at U.S. branch mints prior to 1908 displayed that branch's mintmark on their reverse. Larger denominations of gold and silver coins were labeled with the Dahlonega, Charlotte, and New Orleans mintmarks (D, C, and O, respectively) on the obverse (front) side, just above the dates, in those two years. Carson City, which served as a U.S. branch mint from 1870 to 1893, produced coins with a CC mintmark. The Manila Mint (the only overseas U.S. mint, which produced U.S. Territorial and U.S. Commonwealth coinage) used the M mintmark from 1920–1941. Between 1965 and 1967, as the Mint labored to replace the silver coinage with base metal coins, mintmarks were temporarily dispensed with (including on the penny and nickel) in order to discourage the hoarding of coins by numismatists. Mintmarks were moved to the obverse of the nickel, dime, quarter, and half dollar in 1968, and have appeared on the obverse of the dollar coin since its re-introduction in 1971. Penny: Unlike all other coins, which had their mintmarks on the reverse until 1964, the Lincoln cent has always had its mintmark on the obverse below the date to the right of Lincoln's bust since its 1909 introduction. Nickel: The mintmark was located near the rim of the obverse side, clockwise from the date from 1968 to 2005, to the right of Thomas Jefferson's bust. The redesigned obverse of the nickel which appeared starting in 2006 has its mintmark below the date on the lower right. Many earlier nickels from 1938 to 1964 are still in circulation, and their mintmarks can be found on the reverse to the right of Monticello, with the exception of the 1942–1945 war nickels cited elsewhere in this article. Dime: The mintmark is above the date on the obverse side to the right of Franklin Delano Roosevelt's bust. Quarter dollar: The mintmark is to the right of George Washington's bust. Half dollar: The mintmark is below the center of John F. Kennedy's bust, above the date. Eisenhower Dollar (1971–1978): The mintmark is below the center of Dwight D. Eisenhower's bust, above the date. Susan B. Anthony dollar (1979–1981, 1999): The mintmark is found to the left of Susan B. Anthony's bust. Sacagawea dollar (2000–2016): For coins minted from 2000 to 2008, the mintmark is just below the date. For coins minted from 2009 to 2016, the date, mintmark and E pluribus unum were moved to the edge of the coin. Presidential dollar (2007–2016): The mintmark and date are found on the edge of the coin. Due to a shortage of nickel during World War II, the composition of the five-cent coin was changed to include silver. To mark this change, nickels minted in Philadelphia (which had featured no mintmarks until then) displayed a P in the field above the dome of Monticello. Nickels from San Francisco were minted in the same fashion, and Denver nickels reflected the change in 1943. This new mintmark location continued until 1946, when the nickel returned to its pre-war composition. The P mintmark, discontinued after the war, reappeared in 1979 on the Anthony dollar. By 1982, it had appeared on every other regular-issue coin except the cent, which, with the exception of 2017 Lincoln Cents, still bears no P mintmark. The circulating cents struck in the 1980s at San Francisco (except proofs) and West Point also bear no mintmark, as their facilities were used to supplement Philadelphia's production. Given the limited numbers produced at each facility, they might have been hoarded as collectibles. For 2017, in commemoration of the U.S Mint's 225th Anniversary, the P mintmark was placed on the obverse of Philadelphia-minted Lincoln cents for the first time in the coin's 100+ year history. The P mintmark did not re-appear for 2018 and subsequent circulation strikes minted in Philadelphia. ^ "United States Mint Law and Legal Definition | USLegal, Inc". definitions.uslegal.com. Retrieved 2019-02-13. ^ "The United States Mint · About Us". Usmint.gov. Retrieved 2011-12-28. ^ "About: United States Mint". treasury.gov. Retrieved 2013-02-19. ^ About the Mint at usmint.gov (retrieved 20 April 2015). ^ "A Talk with Miss Margaret Kelly, Director of the U.S Mint"
Wikimedia Commons has media related to United States Mint.